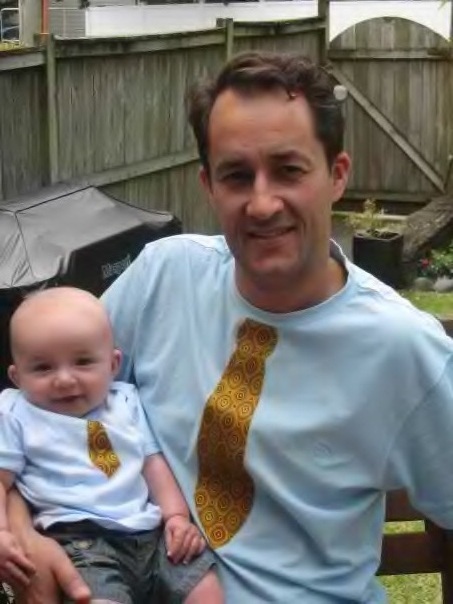 Father's Day is this Sunday here in New Zealand and I'm taking advance orders for Father and Son matching necktie t-shirts. They will be available for pick up at this Sunday's Devonport Craft Market. They are also available for just men or children. Men's t-shirts cost $28 and Childrens' t-shirts are $18. Buy a Father and Son (child) matching combo for $40. To order for pick up this Sunday, please email me by Thursday 2nd September 11am at the latest. My email address is in the sidebar of the blog. The t-shirts will be white with an appliqued vintage tie motif (tie colours will vary but all are funky!). I'm also happy to post these but they may not arrive in time for Father's Day. That is tooo cute Sarah! Well done, I hope you get heaps of orders. these are so neat Sarah, great crafty man gift!